COMPLETE REWRITE OF THIS COMMENT FOLLOWS. I'm sorry for the comment that was here previously. I'm overreacting because this has been a very bad week for me with my niece and the memories being dragged up of my own time being homeless. Which is an explanation, but not an excuse, and I'm sorry. I do like the book, it did resonate with me, I know it was reflective of my own experiences. But reactions to books are subjective, and you have the right to your opinion of and interpretation of the text. I deeply apologize for my reaction to your comment. That was rude of me, and I am sorry. Because I am clearly not handling this issue well and because there's only one moderator for the board, I'm going to go ahead and close this thread for the moment until I can hopefully work out the trigger-issues involved and get a handle on. Yep. Had a boyfriend whose roommate stole food a lot and basically caused a net loss in cash, but getting rid of him was nigh impossible. And that's one of my more mild horror stories. I'm closing the thread for now. May open later when more spoons exist. Oh wow, the roommate issue has brought back some memories for me...in the mid 90s I rented a room in a house in SE Portland OR. Crazyness. I kinda helped babysit my landlady, she was a woman who had been thru a lot of bad things in her life & I helped her as I could. Had quite the mix of revolving roommates in the house. Bullies, people who made me uncomfortable but luckily nothing happened. and a couple who kept stealing my food. This bugged me a lot, I relied on my mental inventory of what I thought should be there so I cd plan out my meals; taking food without asking permission messed me up. There sure are a lot of jerks in the world. I dunno...the Walmart (not Target, but same sort of universe in the end) thing with the clothes, what she was talking about was kind of what she thought was this weird thing happening in her mind. A kind of adversarial mindset popping up, where she worked so hard to arrange things just so, and customers constantly mess it up. And you are forever running after them, fixing it. Having worked some in retail I understand that. Most customers aren't trying to be jerks on purpose, those some do and don't watch their kids who run riot. Yeah, I've heard those objections to N&D, and I honestly think they're both pretty spurious. The roommate one in particular is pretty upsetting to me, because having a roommate can carry huge risks of safety to self. I've known several people who were burgled (or worse) by their roommates (or their roommate's friends/family), so while it's something that *can* help out, it's also something that can seriously hurt. Expecting the working poor to HAVE to give up personal safe space in order to live strikes me as part of the problem -- most of us consider personal safe space to be a human right, not a privilege of the rich. 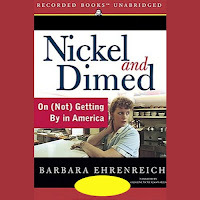 As for the staying in one place, in many of the cases where Ehrenreich was "due" to move, she had already hit a financial crisis at that point anyway, meaning that she'd hit a breaking point where homelessness, skipping on bills, etc. was a genuine concern. In those cases, it wasn't like she was turning down offers of lucrative management to skip town -- she'd reached a breaking point already. And that was *with* starting with money, education, and basically a major headstart to begin with. I thought N&D was a fantastic book, and agree that those objections are not convincing. Especially the opportunity for upward mobility in the food service industry. Even if it's possible to move up and get higher pay and some benefits, it's not a guarantee by any means. Relying on that to get people out of poverty is relying on a pyramid scheme, where the majority of workers do not have a livable wage and even opening a new restaurant to expand the number of positions with benefits increases the number of non-benefted positions by a lot more. The way to help the most people is to raise the minimum wage to a livable level, and protect and expand workers' rights. Once everyone is fed, clothed, housed and insured, we can tout performance-based advancement as a more fair path to prosperity. I think it's also telling that the people who are coming from successful careers are the ones who are getting promoted. A single parent with no safety net is going to have emergencies that will interfere with being a perfect employee who is first in line for promotion. A person with substance abuse problems who cannot get help without insurance can't compete with a person who is trying out poverty for a project. Shepard and McMillan needed something like a phone call every morning telling them whether they would be late to work that day because of some factor common to people living in poverty. Just wanted to say I saw a performance of the stage version of Nickel & Dimed this past Saturday. I'd read the script beforehand, and good thing I did – half the cast swallowed their lines. No projection. There was some sense of privilege on "Barbara's" part, but she did provide a window for a lot of people. Sometime I've got to watch "The American Ruling Class." 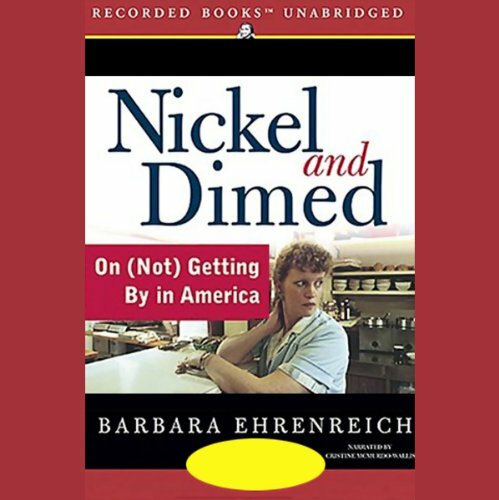 I saw the snippet on YouTube where Barbara Ehrenreich shows up; there's a musical number called "Nickel & Dimed."